Listed on the National Register of Historic Places on April 19, 2001, the Mount Victory Historic District includes the main business block, Methodist Church and Park Place. The village’s significance met the qualifications within 5 of the National Trust’s categories: ARCHITECTURE, AGRICULTURE, COMMERCE, INDUSTRY, TRANSPORTATION. The official ‘Listing Criteria’ is as follows: This property is listed in the National Register under Criterion A for its association with events that have made a significant contribution to the broad patterns of our history. This property is also listed in the National Register under Criterion C for its distinctive characteristics of a type, period, or method of construction, because it represents the work of a master, possesses high artistic values, or because it represents a significant and distinguishable entity whose components may lack individual distinction (e.g. a historic district). 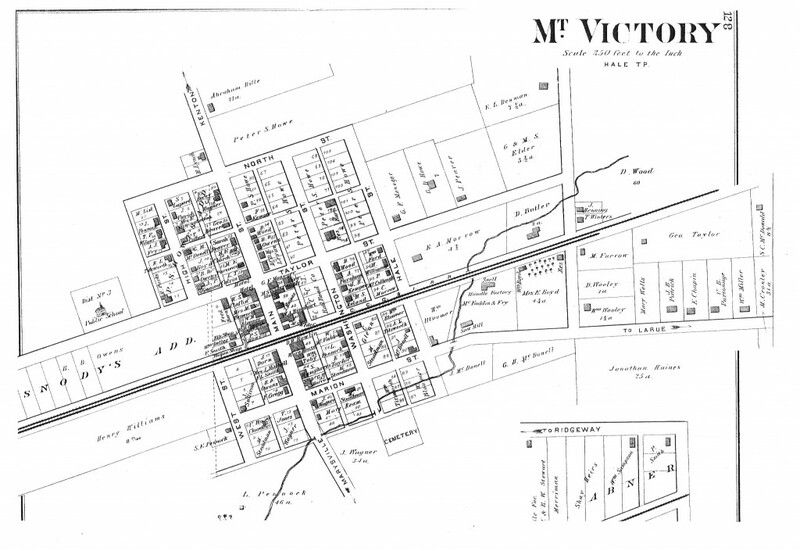 The Mount Victory Historic District is significant under Criteria A and C. Under Criterion A, the district is important for its role in the history of this small northwest Ohio farming and railroad community. The district contains buildings that illustrate the development of the town from the late 19th century to the mid 20th century, reflecting themes of agriculture, commerce, transportation, and community in Mount Victory during this period. Under Criterion C, the district illustrates architectural development in a rural community over the same period of time. The vernacular character of most of the district’s buildings, with simple parapet facades, reflects a small-town environment that lacks the trappings of a larger city. The railroad line which engendered the town remains a significant presence, along with the mill and grain elevator that grew up beside it. A small-scale commercial district, with no building taller than two stories, grew up perpendicular to the rail line. The building which served as a town hall, with council room, jail cell and fire house, is an unpretentious building of simple character. Two buildings in the district stand out as examples of a more high-style design, however. These are “Park Place,” built c. 1872 in an Italianate design for a local merchant and used in the early 1900s as a hotel, and the Methodist Episcopal Church, built in 1903 in a Romanesque Revival style. 1. If I own a building within the historic district, do I need special permission to do what I want to it? No. 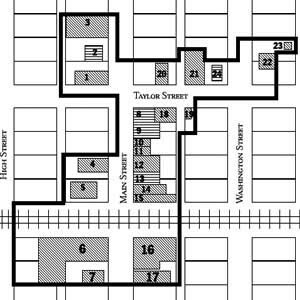 Mount Victory does not have historic district design guidelines or a historic review process as is often found in other districts. The fate of a listed property is soley up to the owner’s discretion. Buildings in the district do not have special protection from deterioration, destruction or demolition. 2. What is the benefit of the historic district? 3. How does having a building in the district benefit property owners specifically? The National Trust offers a tax credit for owners who rehabilitate their building(s) within the district. 4. How do I go about getting the historic tax credits? Owners must qualify for the credits and although many people aren’t willing to deal with the ‘red tape’, it can be a big financial savings if you take the time to go through the process. Depending on what you’re planning to do, the credits may be well worth the effort. – installing pools, hot tubs etc.